One of most awkward kinds of 4/4 that you need for class is one that is in strict tempo without sounding too boxy; strong but not so strong that it sounds like a march; slow but without being flaccid or adage-like; upright and proud but without sounding pompous or baroque; in four, but with strong off-beats. It’s the kind of music that’s defined more by what it isn’t than what it is: you have to constantly avoid drifting into the music that feels more natural. Help is at hand: enter the csárdás (pronounced char-dash, and sometimes spelled czardas outside Hungary – csárdás is the Hungarian spelling), or rather the slow part of that dance, called the lassú – the fast part is called friss. Liszt’s arrangement of this tune, which is as carefully detailed as something by Percy Grainger, is a good example of the kind of rich chord voicing, varied dynamics, interesting phrasing, careful articulation and accentuation that sounds good for class: it’s less about the tunes, than about how you play them. It also shows that backbeat wasn’t invented in the 1950s, it was alive and kicking (or should we say “snaring”?) at least a century earlier. If this piece sounds or looks familiar, it’s because it sounds suspiciously like Glazunov nicked it for the introduction to the Grand Pas Hongrois in Act 3 of Raymonda. It seems Hungarian music was just up for grabs in the nineteenth century – Delibes didn’t write the csárdás in Coppélia, Liszt – like Brahms in his Hungarian Dances – borrowed the tunes for his Magyar Dalok and Hungarian Rhapsodies from somewhere else, from so-called “folk tunes” which nonetheless were written by actual composers such as Jozsef Kossovits and Márk Rózsavölgyi who apparently provided the tune for this dance (well worth downloading the score of a few Hungarian dances by Rózsavölgyi from IMSLP, by the way). Who knows where it originated? You can find it as Jaj de huncut a… on page 103 of Vol 1. of the 101 Hungarian Folksongs, and you can hear it sung in the Youtube clip below (scroll to 1.20 if it doesn’t automatically start there). The opening of the Grand Pas Hongrois in Glazunov’s Raymonda, Act 3. Sound familiar? I owe this piece to one of the people I learned most from, Woytek Lowski. I recorded it on the first ballet album I ever made, which was to accompany his book, The Art of Teaching of Classical Ballet. Woytek wanted something for a warm-up that wasn’t stodgy or relaxing: he said that on the contrary, sometimes it was good to have something that was invigorating and strong. When I played it to him, he probably thought instantly of Raymonda. 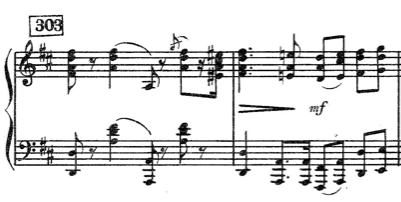 It was only nearly 20 years later that I realised that the Liszt and Glazunov pieces had the same first 2 bars, which shows how important context is when you’re recognising things. If you’re wondering why the first piece of the year is No. 40, it’s because that’s where it belongs in the deck of cards, but I’m not setting myself the burdensome task of doing them in order as the weeks go by. I’m sure I’ll be cursing at the end of the year when I’m fitting the last piece of the jigsaw, but I’d rather curse then, than every week. I’d be lying if I didn’t admit that once I’d heard this lovely piece by Rózsavölgyi, I wished I transcribed that as my csárdás of choice rather than the Liszt, but that’s blogging for you – you live and learn, in that order. 101 Hungarian Songs, published 1921. More csárdás tunes than you’ll ever need for class. Don’t expect a bibliography like this for every entry, it’s just that Hungarian music raises a lot of issues about nationalism, identity, borrowing, folk music and so on. This is just a small selection of what is a huge field. If the references look a bit weird in places, it’s because half of them are generated with Zotpress – a fantastic plugin for WordPress that enables you to cite-and-write using Zotero with WordPress, one of the best things I’ve seen in years – and the other half by hand. Forgive the untidiness, but I’ve only just installed it, and am still playing with settings. Hungarian Dances – a novel by Jessica Duchen with a musical theme, and – such a great idea – a concert of the novel, too, with Hungarian dances. Lizst society journal from August 2014 with a little bit of information about Jaj de uncut – in Hungarian. From what I can gather from Google translate, this song – which is somewhat anti-German – may have been purposely chosen for its sentiments. If you speak Hungarian, please let me know – it’s on page 18. A version of a song used in the Raymonda coda, that suggests it was originally in a mixture of 4/4 and 3/4 – not particularly relevant to this post, but I might as well save the link somewhere. Ballet Playing Card 40 by Liszt is licensed under a Creative Commons Attribution-NonCommercial-ShareAlike 4.0 International License. This entry was posted in A Year of Ballet Playing Cards, Free sheet music for ballet class and tagged Hungarian dance, Liszt, ballet accompaniment, free downloads, free sheet music for ballet class, music for ballet class on January 8, 2015 5:20 am by Jonathan Still. This is gold!!!! I love these proud, strong pieces with a firm pulse that ‘underpin’ the dancers’ movements. Thank you for this super initiative Jonathan! Aw thanks Jo – your comments are so encouraging and such a motivation to keep going – and so helpful as well in developing my own understanding.